Toward the end of each year, the tabletop gaming industry descends upon Dallas, Texas for one final convention: BoardGameGeek.Con. This eponymous gathering of board gaming's leading community, BoardGameGeek.com, has grown into one of the industry's most influential shows by virtue of both timing and clientele. Positioned shortly after Germany's massive Essen Spiel, BGG.CON showcases the hottest new games, and even provides convention staff to teach rules. For fans of Euro-style board games, this is a rare opportunity to play games that won't see US distribution for months, or in some cases, much longer. As for the attendees, BGG.CON's 2,800 gamers may seem paltry up against the 60k+ of a Gen Con or PAX, but that 2,800 figure comprises top designers, reviewers, and the most active of BGG website users (don't worry, the trolls stayed home). Publishers know that this convention holds outsize influence, and it shows: they're all here too! Yet unlike other major cons, BGG.CON's focus is on play, not sales. By weekend's end, attendees will pass final judgement on the current year's slate of games, seed the coming year's releases with all-important buzz, and even get an early peek at far-future prototypes. That being said, it's time to brace your wallet, as this year's crop is quite strong. Codenames challenges players to hone the art of sounding clever but blaming their teammates when they can't put the pieces together. It's not your fault, they should have paid more attention to those high school vocabulary quizzes. With 25 random words scattered across the table, the clue-giver on each Codenames team must utter only a single-word clue in an attempt to tie some number of words together. The clue-giver also shares the number they intended, and their team can attempt that number of guesses, but here's the catch: only 8 of the 25 words will further the current team's progress if guessed. Picking the wrong card may do nothing, benefit the opposing team, or even trigger an immediate loss for the current team.The concept seems simple enough once grasped, but the pressure comes on when teams begin competing to identify their 8 cards using as few clues as possible. Following a limited release back at Gen Con and a sold-out first printing, Codenames has taken hold of gamers, responsible for many a late-night brain meltdown. 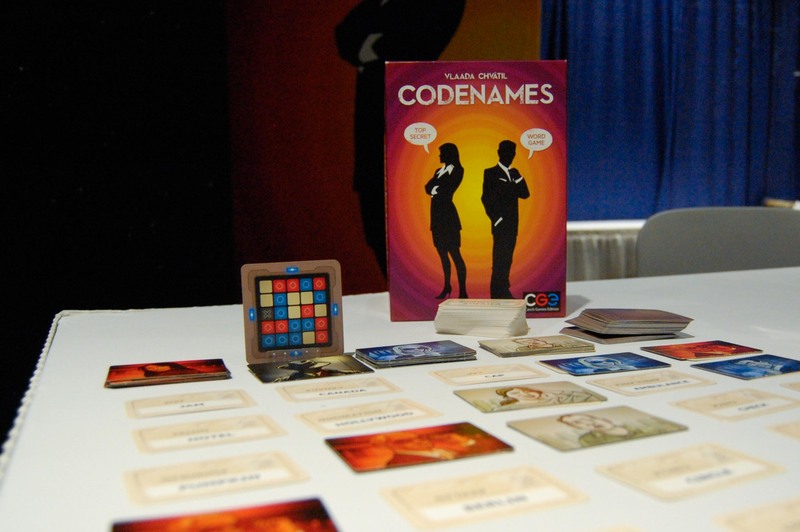 It's safe to say that convention-goers will be pulling out Codenames well beyond 2015. Publisher Czech Games Edition even ran a nightly LARP version of Codenames at BGG.CON, requiring players to act out their clues. Codenames is back in stock and available both in stores and online, with stock updates posted to CGE social media.